An Army Biomedical Equipment Specialist takes care of all the medical equipment used by medical personnel such as doctors and nurses. The equipment ranges from mechanical and hydraulic to electronic and digital. From scalpels to catheters, whatever tools Army medical personnel use, it's almost certainly a Biomed equipment specialist, which is military occupational specialty (MOS) 68A, has handled them. Though not usually involved directly in combat situations, the behind-the-scenes work these soldiers do is critical to the care and health of fellow soldiers who need medical procedures. Soldiers in this job perform preventive maintenance checks and services all medical equipment, including lubricating, adjusting and cleaning. This also includes troubleshooting and checking equipment for any malfunctions or defects, and submitting reports about all equipment inspected. MOS 68A also is responsible for installing medical equipment, and they supervise and advise subordinate personnel. Job training for a medical equipment technician is the usual ten weeks of Basic Combat Training (aka boot camp) followed by 41 weeks of Advanced Individual Training (AIT), including practice in repairing and replacing equipment parts. Soldiers in this MOS will divide their time between real-world experience in the field and classroom instruction, with the AIT to take place at Fort Sam Houston in San Antonio, Texas. The AIT for this job is a bit longer than some others in this field, but it's important that soldiers who want to be medical equipment technicians are trained in the latest principles and protocols for proper handling and maintenance of the tools of the trade. The training will include instruction in the principles of electronics, the use and maintenance of electrical and electronic test equipment, and equipment repair exercises. 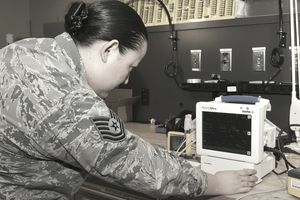 Soldiers who wish to pursue an Army career as a medical equipment technician need a score of 107 in the electronics (EL) aptitude area of the Armed Services Vocational Aptitude Battery (ASVAB) tests. There's no Department of Defense security clearance required for MOS 68A, but a normal color vision is necessary (colorblindness will be disqualifying). There are some parts of this job that are specific to the military, but several civilian career paths may be open to you thanks to the training you'll receive. You may be able to pursue work as a surgical technician, once you've obtained the necessary license for your area. You're likely qualified to work as a supervisor of mechanics or other personnel who work with tools, or as a medical equipment repairer. What Is a 94F Computer/Detection Systems Repairer in the Army?